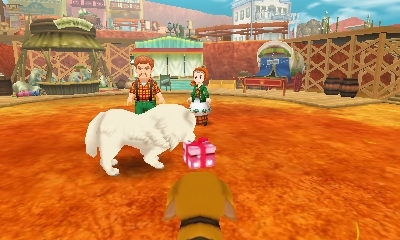 After changing into a dog, go for a stroll "around the train tracks"
You see Megan and Hector talking to a lady, who leaves an important package behind after she walks away. Megan directs Hector to take the gift box and chase after the lady. Hector doesn't seem too interested, but reluctantly agrees to do it. Megan tries to convince him to do it, even if women make him nervous, but Hector says he's just not talkative with anyone else other than his late wife. Their dog, Buddy, steps up and volunteers to take the package (Megan can't hear her dog talk, of course, just "bark bark bark"). The dog picks it up and runs after the lady. Eventually, Buddy comes back to tell Megan that the task has been complete. Megan pats her dog on the head and thanks him for the help. What a wonderful boy Buddy is! On the other hand, Megan is a bit disappointed how hopeless her son is at talking to women.